Today as part of the promotional street team tour, we have an awesome giveaway of Falling Kingdoms by Morgan Rhodes! Thanks to Penguin, Good Choice Reading & A Life Bound by Books for organizing! Can't wait? Buy your copy here! Mark it on Goodreads here. Love high fantasy! Winning this would be so awesome! Yeah I'd like to think I am. I like urban fantasy/magical realism slightly more, but high fantasy beats them all in terms of epic scale and world-building (i.e.- Yes, I love it). i love reading fantasy books! Sometimes. I like fantasies like Maria V. Snyder's books that have magic involved with a good dose of action and some humor mixed in! thank you so so much for the international giveaway, i would love to discover this book! I was a huge fan in my teens but haven't read one in a while! I really want this one though, I think I've let quite a few good books slip through my fingers :) Thanks so much for making hte giveaway international! I so love high fantasy and can't wait to read this. 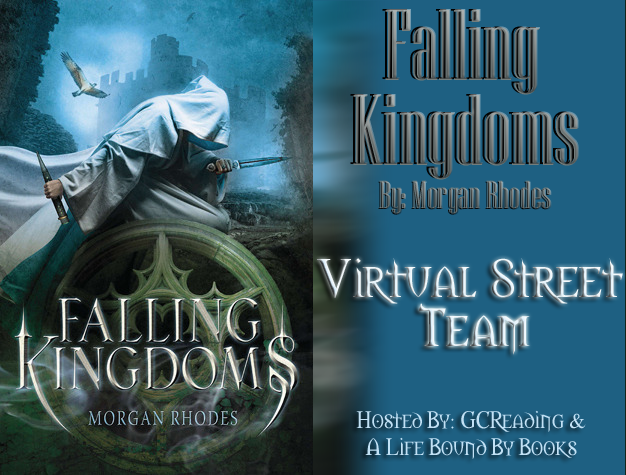 High fantasy is really a mixed bag for me, but I can't wait to read Falling Kingdoms! I am a huge fan of high fantasy! Thanks for the chance to win Falling Kingdoms! I love high fantasy. It is so much fun escaping into another world. Oh yes, high fantasy is my favorite. Really happy to see it's becoming more popular in YA. I'm a HUGE fan of high fantasy! Kristin Cashore and Cinda Willams Chima are two of my favourite authors! Yes, I love high fantasy, as long as it makes m believe in the world as I'm reading it. My favorite author is Guy Gavriel Kay. Yes! Several of my favorite books are high fantasy. Thanks for the giveaway! Most of the time, yes. Thanks for the giveaway, I'm really looking forward to Falling Kingdoms. I love high fantasy. It's one of my favorite genres to read. Thanks for the giveaway! I liked high fantasy more when I was younger, but I still like it. That cover image is really special! High Fantasy has a permanent tattoo on my heart. I think it started with David Eddings' Pawn of Prophecy when I was a kid and went forward from there - Brandon Sanderson, GRR Martin, Rothfuss, Saldin Ahmed, Alexey Pehov, Jacqueline Carey, even Guy Gavriel Kay. All excellent stuff. I'm sure what high fantasy is, but I love a story that takes you out of this world and into theirs. Can't pass up this book, great giveaway! I actually haven't read much high fantasy, but I'd like to expand my horizons and give it a try. Thanks for the giveaway!! High fantasy is one of my favorite genres! I grew up reading it. Sword of Shanara is the book open on my blog. I like quality high fantasy interspersed between other genres when I read. I like to mix it up. Yes! I love it! Thanks for the chance to win! I love fantasy but I don't get a chance to read alot. I am not a fan of high fantasy but I would like to learn to be one. I absolutely adore high fantasy! Thanks for the awesome giveaway! Not really, but my teen daughter loves it. Oh, yes. I love high fantasy. The story always awesome!! I am a fan, but it isn't something that I can read back to back to back. But I really love to read them about once a month! I'm a massive fan... Love all those blood-pumping excitement Thanks for Int giveaway. I love high fantasy! Haven't read many books but the ones I did were amazing :) Thank you for the international giveaway. I'm a huge fan of high fantasy! I've loved it ever since I was a kid. Thanks for the great giveaway! Yes, I love high fantasy! I don't read it a lot, though, but when I do I always ask myself, "Why don't you read more high fantasy???" Thanks for the giveaway! Yes, I've recently discovered a love for both epic and high Fantasy. YES! I had no idea how much until this year. Not until my husband started reading it and gushing about it. My curiosity drew me to pick up his books and now I love them! I'm actually pretty okay with it. While it's not my favourite genre, I like it a lot. Im a big fan! I also loved Throne of Glass! Yes. This book sounds great! I have not read a lot of high fantasy, but it is fascinating. I love High Fantasy and I can't wait to read this! I love fantasy and since it is Christmas shopping season I don't have much money left over for books soo...Yah! I am excited for this one. Winning it would be even more exciting! Absolutely. Love it!! This book looks awesome. Thanks. I'd love to win a copy of this book. Sounds awesome! Yes, I love high fantasy! It's the best because it really takes you out of what ever is going on in your life currently if even for a short time. I've been a fan of high fantasy for more years than I can count and it still amazes me how many new worlds are conceived. I absolutely adore high fantasy. It is my favorite genre and I have been eagerly waiting to get my hands on this book!